Two interesting ‘new’ shops for foodies in Leeds, one selling Romanian food and ingredients, the other ‘hot’ chilli products. In my post of 5 November I mentioned the difficulty of getting cornmeal as good as that I was used to in Romania and that I would visit a ‘newly opened’ Romanian shop in Leeds Kirkgate market to see if some could be brought from my wife’s grandmother’s village. It turned out that the shop stocked some rustic cornmeal (malai) and this is much better than those which I’ve been able to get so far. It’s not quite as good as grandma’s but I think it’s a matter of texture as it seems to have a bit less bran (tarate). Wheat bran is the basis of bors (odd that a Romanian product doesn’t use the correct Romanian character on the label – see picture; the final ‘s’ should have a cedilla to give it the ‘sh’ sound. I don’t have it on my computer. However, ‘sh’ or no it’s great to have real bors as it gives a much better taste to the sour soup made throughout Moldova, also known as bors (borsh), than the dry packeted stuff produced under the Maggi (Nestle Slovakia) and Delik’at (Unilever Romania) labels. By the way, Romanian bors does not necessarily have beetroot; two of my favourite versions are potato bors (vegetarian) and bors made with chicken wings. Apart from the malai and bors, I bought some bouillon (tomato paste) with the renowned Romanian brand ‘Olympia’. I know tomato paste (puree) is widely available here in UK but if you have tasted Romanian tomatoes you will know why I bought bouillon. My other two purchases (pictured at the top) were a chunk of one of my favourite cuts of cured pork, known as kaiser, and another of my favourites – toba – which translates as brawn, but it’s a lovely chunky brawn. I didn’t buy this time something else which I was delighted to see stocked – Borsec mineral water, in my opinion the world’s best-tasting mineral water. Living in Yorkshire I generally drink tap water, having left it to stand to get rid of the chlorine introduced by Yorkshire water and trying to ignore being poisoned with fluoride. But I’ll buy some Borsec in the future for the taste. Borsec, a small spa town 900m up in the Romanian mountains, has many springs of carbonated water. Some of the other products on display are shown in the slide show below the picture in the shop below. The Leeds shop is run by Marinela, who hails from the Romanian capital Bucuresti (Bucharest), and was opened three months ago (I happened to find it on the day it opened). It’s in what is currently the ‘butchers’ row’ in Kirkgate market but will move to another part when some renovation of the market starts in February next year. 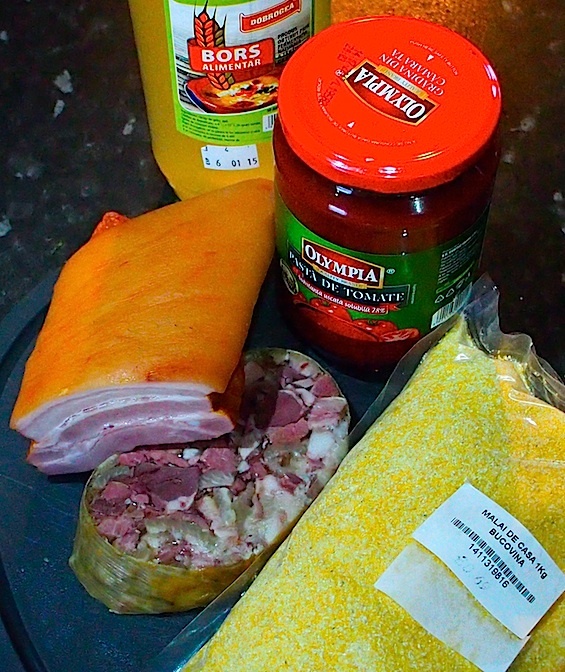 There are, of course many more Romanian cured meat products in the shop, some smoked – ribs (costita), ciolan (leg) and a range of salamis including the exceptionally good, very dry, Sibiu salami – as well as things like pickled white cabbage (vasa murata), used to make sarmali (stuffed cabbage leaves), and tripe to make another of my favourite soups – ciorba de burta. Frank Jay, founder of the Chilli Shop in Brighton, has moved north to Yorkshire (sensible guy) and opened a chilli shop in the Merrion Centre in Leeds (a few minutes walk from Kirkgate market). I’m not myself a great fan of very spicey-hot food but this place is a Mecca for anyone who is (and there are armies of vindaloo eaters in this curry county). Jack is a friendly guy and knows his chillies (and probably his onions too). 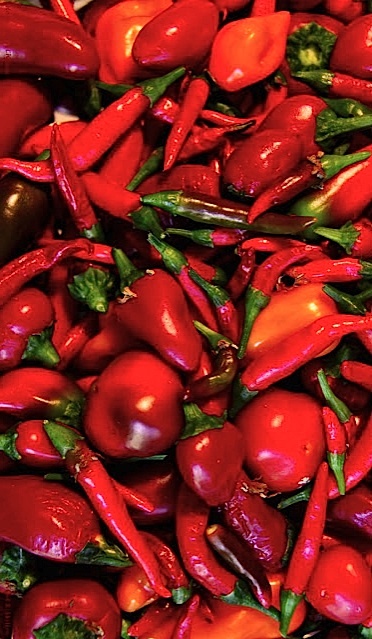 The shop is unique with 50 free tasters from 1/10 ‘hotness’ to 75/10 and Jack will explain to visitors the meaning of this index, from 0/10 of the bell pepper to the hottest chillies like the Ghost and the Trinidad Moruga Scorpion. Then there’s standard grade police pepper spray … He’ll arrange chilli eating contests at events and parties too (frank@chilli-shop.co.uk). The shop is stocked with a host of chilli-laced products including chocolate, toffee, sauces, snacks, cheeses, jams, etc, some familiar (like Tabasco), some a revelation, and some chilli-based gifts. A hot chilli (locally grown and something like a Jalapeno to my inexpert taste) is usually munched with the Romanian bors mentioned above; my wife likes it but it’s not for me. Chilli is a ‘no no’ for me. I have a geographical tongue which inhibits extremes. I’ve tried and I really suffer. Shame really. I can’t sample taste any of my recipes for heat to include for others, so tend to use aromatics as opposed to heat. Interesting cultural read. Very informative. Thanks Gray. 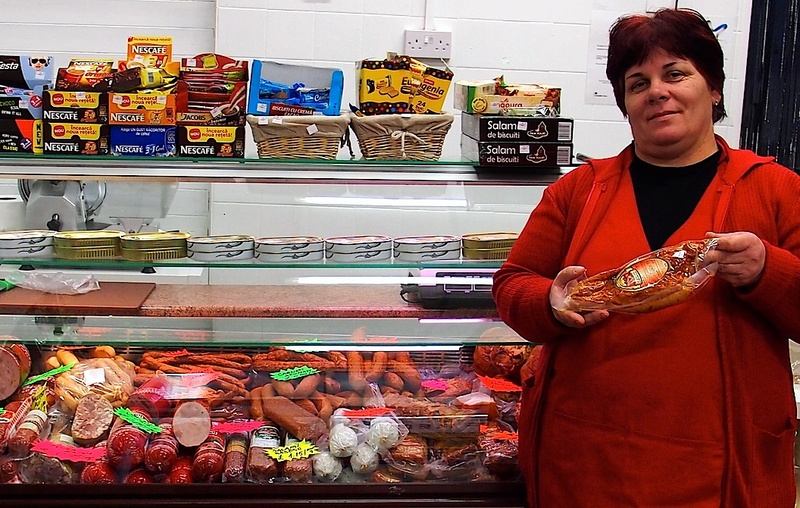 Mirela moved her Romanian shop to Harehills from Kirgate a while ago (outrageous rents in the market – short-sighted council). The chilli shop disappeared even longer ago. unde este mai exact magazinul acesta ?